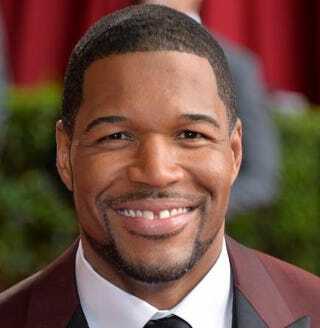 Former football star and current talk show host Michael Strahan is expected to join the cast of ABC's Good Morning America on a part-time basis, the Associated Press reports. While the deal has not been completed, a person with knowledge of the negotiations who spoke on condition of anonymity told AP that Strahan will work periodically during the first hour of GMA. According to CNN, Strahan will drop in for features on the 7 a.m. show and then shuttle a mile away to to join co-host Kelly Ripa for Live with Kelly and Michael at 9 a.m.
GMA, the top-rated morning news show, has lost two male cast members in the past four months. First, Sam Champion left to go to The Weather Channel, then Josh Elliott moved to rival NBC Sports. Although there were rumors about Elliott's departure, plans for the addition of Strahan predate Elliott's exit, AP reports. If Strahan is added to the GMA team, he will join cast members George Stephanopoulos, Robin Roberts, Amy Robach, Lara Spencer and weather forecaster Ginger Zee.